Last Halloween, the bloke picked up a novelty jelly mould. 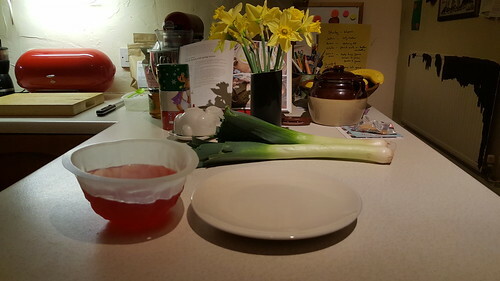 Up until that point, I had been making jelly in a simple ceramic bowl. Now, I can no longer make jelly unless it is in the jelly brain mould. I mostly make strawberry jelly brains, since that is Humuhumu's favourite flavour. Once I made vegetarian jelly brains using agar powder and apple juice, when Sister-Out-Law and niecephews came to visit. I had intended to colour it red. Unfortunately, the only food colouring I had to hand was black. So I ended up making grey vegetarian jelly brains. They looked horrible. Tasted great, though. I won't show you photos of the vegetarian jelly brains. These are gelatine jelly brains. Still jelly brains, though, so I've put them behind a cut. Here are the jelly brains in their mould, fresh from the fridge, sitting on our kitchen counter. The kitchen counter is adorned with two large leeks, a bunch of daffodils, our Ukrainian cookbook, the rabbit-shaped butter dish, a very old ceramic cookie jar, and various other doodads. 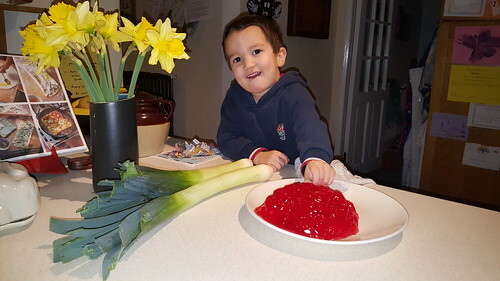 Keiki is very keen to see the jelly brains turned out onto the plate. 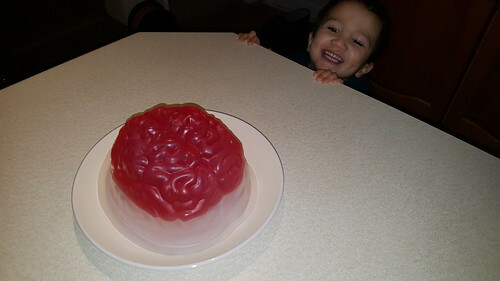 Now that the jelly brains have been freed from the mould, Keiki is ready to take on the monumental task of...snaffling them all and eating them. This entry was originally posted at https://nanila.dreamwidth.org/1125673.html. The titration count is at .0 pKa. Ok one. jello brains for the win hahahaha and two, Keiki looks so big! Such a boy and not a baby. When did that happen?? I knoooow. He went into pre-school from toddlers at his nursery and that finalised it for me: he's not a baby any more. It is very satisfying to say to the children when they're not eating their dinners, "Oh, so I guess you don't want any jelly brains, then? Too bad."